The brief for this garden included producing a beautiful view as seen from the house through the new bi-fold doors. The large shed was to be retained, and several seating areas were requested. The whole should be easy to maintain through the client’s retirement years, and suitable for grandchildren to enjoy. The client had particularly liked her visit to the Alhambra gardens on her travels to Granada. While we strayed from our amusing and rather grandiose ‘Alhambra’ theme, the flavour of a formal garden was included with clipped box cones and straight lines. Patterns in the paving were also linked to this theme, along with large planted containers and an olive tree. 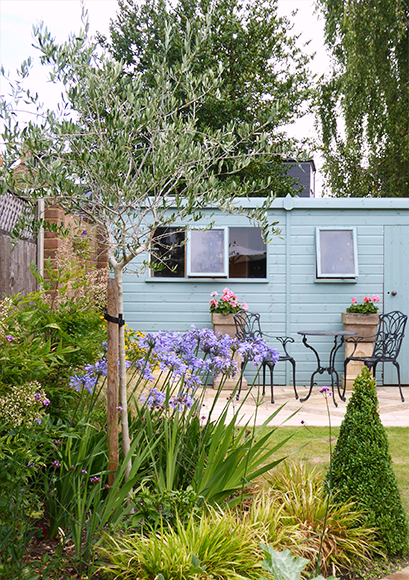 The patio area is large enough to entertain, and a smaller area near the painted shed is also useful to watch the children as they play. A raised bed contains herbs and alpine plants, and a nearby seat is sited near the vegetable area. Colours chosen for the garden were similar to shades used in the house, linking the outside and inside areas when viewed through the windows.